PHOTO BY JOHN SCHLIA Caprese-topped Angus beef burgers. PHOTO BY JOHN SCHLIA The banana pancakes are good subsitute for dessert. Having never lived in the direct Park Avenue area, and as a non-drinker through my 20's, I don't have much of a nostalgic appreciation for heading out to weekend brunches at the neighborhood restaurants. I only went when friends would drag me along, but The Frog Pond was one that I ended up at a few times. In recent years, The Frog Pond has seen a name change (from Charlie's Frog Pond), a cosmetic overhaul, and an expansion of its dinner offerings. I do think the more subtle décor is a step in the right direction. Gone is the yellow wallpaper, replaced with lightly textured green walls and "frog skin" banquettes running down the sides. But still in place is the small counter in the back and the Ramon Santiago art pieces that provide links to the past. The breakfast and brunch menu offers that link to the past as well. After talking to our waitress during the meal, it turns out that both that part of the menu and the a.m. cook staff have remained the same through the recent owner transition. For breakfast, my wife and I stuck to a trio of classic diner-style dishes to see how it stood up. She went with The Berkley omelet ($6.95), which is a bacon, mushroom, and cheese affair with three eggs, and I decided on the sausage gravy and biscuit special ($9). The omelet was overloaded with cheddar cheese and could have used some crispy diced bacon instead of slices in order to add some contrast and make it easier to eat. I enjoyed the thick, lightly peppered sausage gravy, although it was relentlessly rich when combined with the denser than expected biscuits. The corned beef hash ($4.50) was probably the biggest disappointment of the three dishes since it only had a smattering of corned beef in the potato base and didn't have a meaty kick. Going along with what I mentioned earlier about nostalgia, I think for those that enjoyed the restaurant's food during their formative years will be satisfied that the breakfast menu hasn't changed and remains consistent, but if, like me, you are looking for a more modern attention to detail when it comes to ingredients and preparation, this is not the place for you. Where I was more impressed was with the dueling burgers we had for dinner on a Tuesday night. 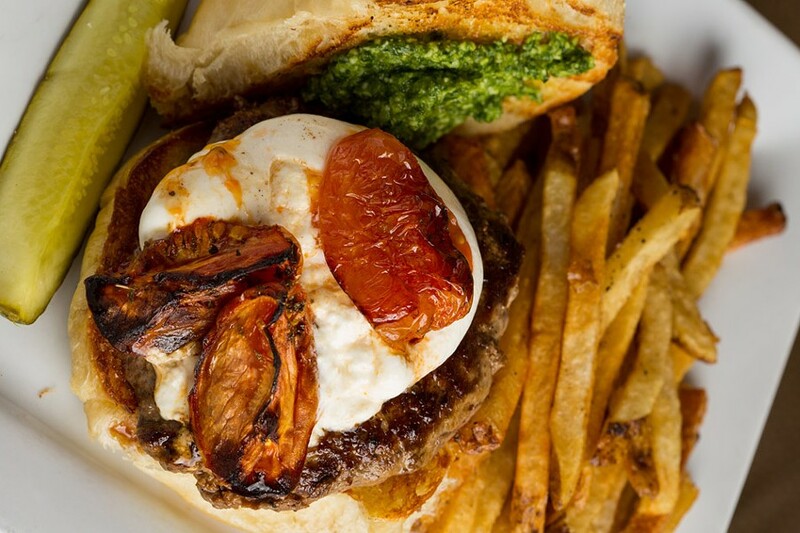 The first was a Caprese-topped Angus beef burger ($13) which impressed with fresh mozzarella and a delightful, full-flavored pesto mayonnaise. The other element that popped was the roasted tomato pieces that added some fruity acidity and sweetness. The burger itself, though, was too finely ground, didn't have much beef flavor to speak of and was the weakest part of the dish. The house made veggie burger ($9.95) — an interesting combo of potato, lentils, carrots, and celery — was much more successful, both texturally and flavor wise. Both the fresh cut regular fries and sweet potato fries were shining examples of execution: crispy and nicely browned without being overcooked. I'd be happy getting these alongside just about every burger I've had. 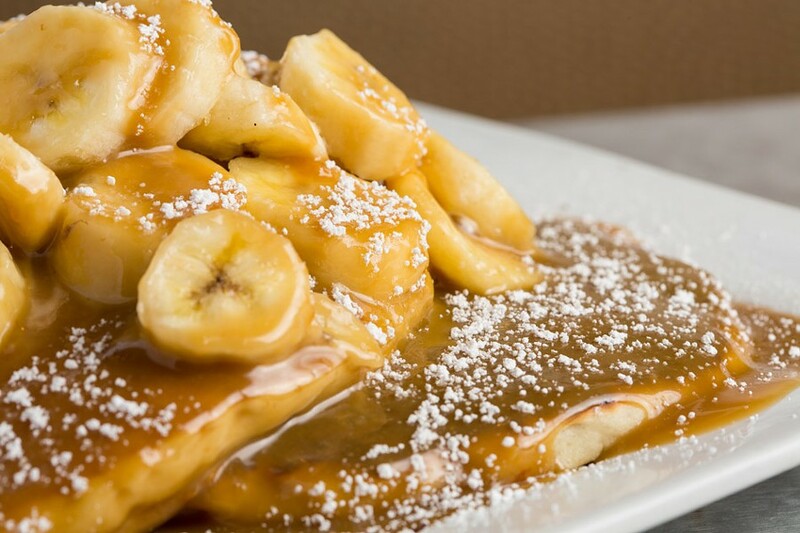 We gave the breakfast part of the menu one more shot as we ordered the banana pancakes with caramel sauce as a substitute for dessert. The pancakes had good rise and crust, and were tasty enough to be eaten on their own. Although I enjoyed the dark caramel sauce and its noticeably large amount of butter, it was super sweet and could have used an extra dimension. We took some home with us and added salt and whiskey, which really brought that rich sweetness into balance. I also would have liked to have seen the bananas caramelized as the menu implied. Despite some possible tweaks, this is a nice, indulgent dish to pass around the table, and was the best breakfast item we tried. If you're expecting more than straight diner food for breakfast, I think you'll end up disappointed. The dinners and burgers, though, seem to have some potential with slightly elevated classics, and of course there is outdoor seating right on Park Avenue. This isn't somewhere I'll be coming back to, but I have no doubt that many reading this will remain regulars. The Frog Pond has been a Rochester institution from long before I came around, and will assuredly remain so with nostalgia on its side.